Whomp whomp. There're no Captain Americas for sale. 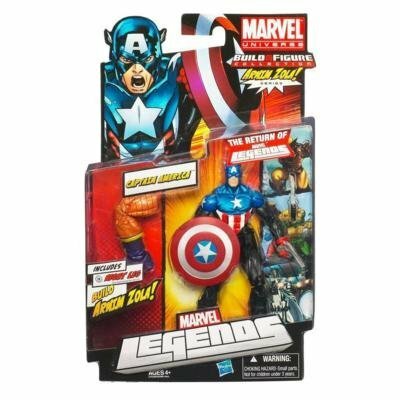 Heroic Age Captain America is clad in a mixture of costume and black fatigues, and is equipped with shield and pistol. Originally deemed unfit for service, Steve Rogers volunteers for the experimental Super Soldier Serum and is reconstituted into Captain America, a master tactician and one of the most skilled physical combatants in the Marvel universe. During the Heroic Age storyline Steve Rogers is appointed to replace the deranged Norman Osborn as the United States’ head of security. Following the dissolution of the Superhuman Registration Act, Rogers reactivates the Avengers, and serves as the leader of the Secret Avengers. I only know a small amount on Bucky Cap but can say think this is a great fig. Love that all the accessories fit on the fig and that is a huge plus. I guess he's shrinking in his old age because the Bucky toy is taller than this new incarnation of Cap. The articulation is good on this figure but I'm not crazy about the legs. The belt hinders their forward and back movement. Plus if you move them the knife becomes bent. I am a Captain America fan, and is why I purchased this in the first place. The only think I don't like that much is that its bucky, and not steve, but still, its ok.